Designed to ease the burden of loading and unloading autoclaves, this specially designed system allows even the heaviest loads to be transferred with the minimum of effort. The system removes from the operator, the hazards normally associated with manual transfer of hot, dangerous loads. There is no necessity for protective gloves or clothing as no direct contact is made with the load. 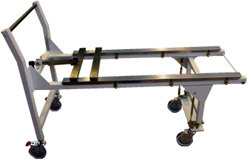 A floor mounted docking device allows the system to be used in conjunction with most makes of autoclave without modification, the docking device aligns the trolley with the autoclave and retains the front legs and castors as the trolley arms enters the autoclave to load or unload baskets and pallets. The versatility of the system allows one or more trolleys to service a batch of autoclaves and loading stations within a production area.